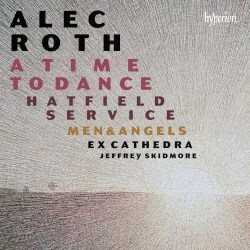 Jeffrey Skidmore and Ex Cathedra have been staunch advocates for the music of Alec Roth – and rightly so. One of their most significant collaborations with him was the remarkable piece Earthrise, commissioned for and first performed as part of Ex Cathedra’s fortieth anniversary celebrations in 2010 (review). Subsequently, they made a fine recording of Earthrise and several other Roth pieces (review). A Time to Dance, which is an even more substantial score, was not commissioned by Ex Cathedra, though they gave the first performance, in June 2012. A few months later I had the opportunity to review the second performance for MusicWeb International Seen and Heard and I was very impressed. In the performance that I attended A Time to Dance was paired on the programme by Bach’s Magnificat in D major. That was no accident; Roth’s piece was deliberately conceived as a companion piece to the Bach and his scoring is almost identical to Bach’s save that he only uses one soprano soloist where Bach requires two and that Bach’s timpani are replaced by a small array of modern percussion instruments. A Time to Dance can be performed using either modern or period instruments. A Time to Dance is right in the mainstream of anthology works by English composers. Alec Roth has selected twenty-nine different poems, either by English poets or by non-English authors in translation. The commission for the score came to mark the fiftieth anniversary of the Summer Music Society of Dorset and, as Roth writes in the booklet, the brief was “to provide a large-scale celebratory work, reflecting the passage of time and fifty years of music-making.” The work is divided into four sections, each concerned with one of the seasons of the year, starting with Spring, and with different times of the day. These four sections are framed by two introductory movements – Processional and Prologue – and two more – Epilogue and ‘After-dance’ – that wrap everything up nicely. A Time to Dance opens in terrific fashion. The bass soloist and then the choir sing the famous lines from Ecclesiastes, beginning ‘To every thing there is a season…’The music is slow and chordal in nature and heard from a distance at first, gradually getting louder as the singers get nearer. The only accompaniment is provided by occasional gentle chimes from a hand bell. Then comes the ‘Prologue: Sunrise’ for bass solo, which is a setting of lines by Edward Thomas. It’s here that we realise that we may be in for something rather special. The singer’s music is very interesting but what catches the ear particularly is what I can only call the arresting use of three valveless trumpets which accompany the singer with exultant fanfares. The first main section, ‘Spring Morning’, features the soprano soloist. Roth gives his soprano fresh, eager-sounding music to sing and Grace Davidson really delivers. Again the trumpets feature, this time echoing as the soloist sings a setting of words by Christina Rossetti. The opening and closing movements in this section are for the chorus and are distinguished by vigorous, rhythmically exuberant writing. Especially in the first of these choral movements I was reminded of the exciting rhythmic impulsion one often encounters in the music of John Adams. An additional delight in this section is the gorgeous singing of Miss Davidson in the eager music to which Roth sets Gerard Manley Hopkins’ lines, ‘Nothing is so beautiful’. The second section is ‘Summer Noon’ in which the tenor is to the fore, here the excellent Samuel Boden. Have you ever heard an oboe d’amore play the Blues? Well, we come close to that in the sultry tenor solo, ‘In Summer’s heat’. This is a frankly sensuous setting – a slow, Latin-American dance - of some pretty steamy lines by the Latin poet, Ovid. The colours that Roth conjures up in the accompaniment are inspired, not only in the use of oboe d’amore but also the chamber organ. Later in this section it’s intriguing to hear the sound of period flutes using the flutter-tongue technique as the tenor sings ‘Thirsty Fly’. The Summer section closes with a choral setting of ‘Give all to love’ by Ralph Waldo Emerson. This is another Adams-like rhythmically pulsing setting in which the valveless trumpets indulge in some Big Band-style pealing. ‘Autumn Evening’ brings another change of mood and we hear the alto soloist. Matthew Venner has a plum solo in William Blake’s ‘The Evening Star’. This very fine movement features eloquent music delivered intensely by Venner. The use of distant offstage trumpets to represent the radiance of the Evening Star is a marvellous touch. Earlier in the section I loved the witty and attractive setting for woman’s voices of ‘Humdrum’ to which the discerning use of additional percussion such as a desk bell, a washboard and a dinner gong adds gentle spice. There’s also a touching, subdued setting for the choir of lines from Emily Brontë’s ‘Fall, leaves, fall.’ Here the only accompaniment is from some discreet handbell chimes. Finally comes ‘Winter Night’. In Longfellow’s ‘Snowflakes’ I love the way the gently pulsing flutes suggest the falling flakes. The bass soloist has a very serious, powerful setting of Ernest Dowson’s ‘Dregs’ in which he’s partnered by a mournful cello. The movement that especially caught my ear was the slow, grave setting for choir of ‘Lights out’ by Edward Thomas; this is fine choral writing, sparely accompanied. For the Epilogue all the soloists are involved. This is a setting of lines by John Donne and Robert Bridges and Roth builds the music to a huge climax for the final Donne couplet. In the concluding movement, ‘After-Dance: Proper Exercise’, Roth wants the singers actually to dance and he facilitates this by including in their parts hand clapping so that they have to dispense with their scores. Each soloist has a verse to sing and then the full ensemble sings the refrain, which has a memorable, catchy melody. I very deliberately avoided re-reading my review of the 2012 live performance until I got to this point in typing up this review of the CD. I recall enjoying the Birmingham performance and being very impressed by the music. However, revisiting my 2012 comments now I think that, if anything, I may have under-appreciated A Time to Dance. Perhaps a better way of putting that is to say that the closer perspective of a recording – and the opportunity for repeated, more detailed listening – has opened my ears to felicities in the scoring that I missed first time round. Also, I was seated at some distance from the performers that afternoon in Birmingham Town Hall so I couldn’t appreciate as much as I do now the quality of the solo singing – all the present soloists except Samuel Boden took part in the performance I attended. It’s the sheer quality of Alec Roth’s invention that really makes its mark in this recording. Previous encounters with his vocal music have made it clear to me that this is a composer who writes imaginatively and with great understanding for the human voice. A Time to Dance confirms that impression in spades. Just as impressive is the ear-tickling way he writes for the instruments in this score. The music is strongly melodic, accessible, very pleasingly harmonised and fits the selected texts like a glove. Charles Jennens, who compiled the libretto for Handel’s oratorio Messiah apparently described Handel’s masterpiece, somewhat incongruously, as ‘a fine Entertainment’. I would suggest that this description suits A Time to Dance to a tee. In saying that I don’t mean in any way to belittle Roth’s score - far from it - but the piece is entertaining in the best sense of the word. I hope this fine recording will bring it to the attention of a wider public, as it deserves. I hope also that other choirs will take it up, especially as it can be performed on modern instruments. Mind you, any ensemble taking it into their repertoire will need to be on their mettle to match the achievement here of Jeffrey Skidmore, his four fine soloists and his excellent choir and orchestra. For the two short additional pieces a smaller choir is used. The ‘Mag’ and ‘Nunc’ are interesting in that the organ part is designed for left hand only and, ideally, to be played on a small instrument. Roth says he designed these canticles to be “simple and functional” and so they are but they’re also very attractive. Men and Angels is a subdued, thoughtful setting for unaccompanied choir of George Herbert’s Antiphon II. I liked it very much. It only remains to say that Alec Roth’s booklet notes are excellent and that producer Nigel Short and engineer Tony Wass have used the warm acoustics of All Hallows, Gospel Oak intelligently and have presented the music in splendid sound. In terms of both the music and the performances this is a very fine disc indeed.